Myjad Data Recovery Wizard is an almighty tool to restore photos, videos, music, docs, zip, pdf, rar, and more even accidentally empty the recycle bin, format the partitions, etc. You are provided 4 recovery modes to retrieve your data. Formatted or corrupted the partitions? Tabbed “Shift+ Delete” and delete your data forever? Restored the original file names? 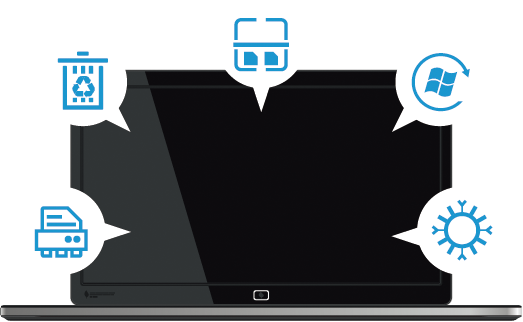 Your data is easily got back even in these circumstance. It also allows you to restore data from formatted hard drive, USB drive as well as memory card inserting into digital camera like SD Card, XD card, CF Card, Multi-media Card. Rebuild damaged partition table, backup or restore partition table as well as recover all lost data in partition or drive. Recover data including FAT 12, FAT16, FAT32, NTFS, HFS, HFSP, EXT2, EXT3. It will be the best choice if you failed to recover files with Deleted Recovery and Format Recovery, please try this option. Accidenatally tabbed "Shift + Delete" and deleted data permanently. Empty recycle bin unintentionally and all deleted data gone. Myjad Data Recovery Wizard can help you recover all the data lost in these situations. 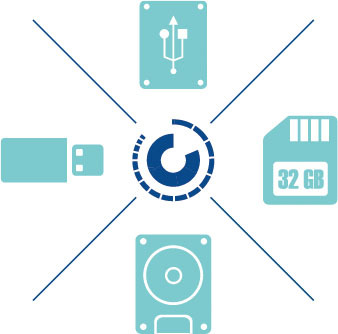 Storage devices, such as PC Hard Drive, SD card, Memory Card, USB, Flash Drive, Pen Drive and other storage devices are all recoverable if you try this excellent tool: Myjad Data Recovery Wizard. It can easily retrieve files that stored in your SD card and more with simply one click. 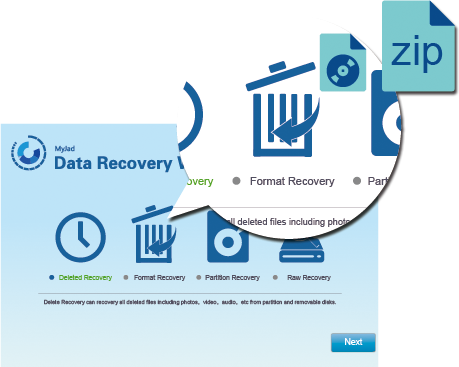 Myjad Data Recovery Wizard can completely recover 500+ file types of lost data: photos, videos, music, docs, zip, pdf, rar, and much more without any damage Note: Support almost all file system such as FAT12/16/32, NTFS, EXT2/3, HFS/HFS+, etc. MP3, APE, WMA, WAV, FLAC, etc. DOC, XLS, PPT, MDB, DOCX, XLSX, PPTX, MDBX, RAR, ZIP, PDF. JPEG, PNG, GIF, TIFF, BMP, PSD. Canon CRW and CR2, Nikon NEF, Sony SRF, Olympus ORF, Kodak DCR, Konica Minolta MRW, Fuji RAF, Panasonic RAW, Sigma X3F, Samsung DNG, Pentax PEF, Leica DNG etc. MOV, MP4, MPEG, MTS, AVI, RMVB, ASF, WMV, 3GP etc.